Stacy rocks! I participated in one of her workshops and came away with the spark of inspiration that has been eluding me for quit a while. Working with the horses was not only fun but extremely insightful for me. 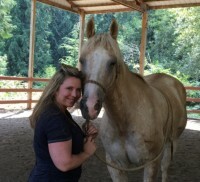 Stacy did a wonderful job of letting us feel things out for ourselves, guiding us at the right moments, and then helping us discover how what we learned from the horses applies to how we work with ourselves. Stacy's approach to coaching is unique, well-grounded and very effective. I can't thank her enough for the inspiration I received. Stacy has helped me to clearly identify my goals, and led me to better understand and implement successful personal and professional communication. 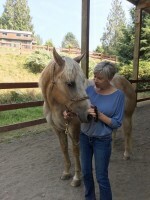 Through her Equine Assisted Coaching program I have been enlightened by the incredible intuitive horses on how to connect on a deeper level with others, to commit and focus on the goal while being open, creative, willing and confident. I highly recommend Stacy as a Life Coach, she has made a positive impact for me personally and professionally! Thank you Stacy! Working with Stacy and her horses offered a unique experience for our entire team. 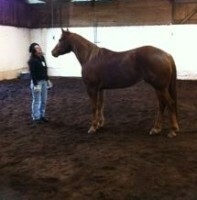 In the beginning of the workshop, the horses seemed to overwhelm the stable and space, seemed larger than life. Half way through the workshop, the horses seemed to appear smaller, we didn't feel as intimidated by them. The lessons learned were: who on the team can motivate, who is timid, who has the energy to make changes in an instant, what are the boundaries we deal with everyday with people and how to communicate non verbally. It was amazing how each team member's personality popped out when working with the horses. A true and great experience for anyone wanting to learn more about yourself and your team. Stacy was outstanding as a leader and the horses were stars. They truly led the workshop. I am so thankful that Stacy and I connected. Stacy has helped me venture forward while finding enjoyment in the present. I am more in touch with my personal values and interests. I am able to look at my life through fresh eyes and like what I see. I discovered I don't need to work to have esteem but it is an essential part of me. And if I am to work then it should be a great job. Stacy is knowledgeable, insightful, compassionate, resourceful and engaging. And she listens really well! Stacy asks for more; works the sides of boxes, expanding and poking daylight into them; believes in dreams and desires; and enables hope and enjoyment for life. I look at my life through fresh eyes and like what I see. I discovered I don't need to work to have esteem but it is an essential part of me. And if I am to work then it should be a great job. Stacy is knowledgeable, insightful, compassionate, resourceful and engaging. And she listens really well! Stacy asks for more; works the sides of boxes, expanding and poking daylight into them; believes in dreams and desires; and enables hope and enjoyment for life.the stable and space, seemed larger than life. Half way through the workshop, the horses seemed to appear smaller, we didn't feel as intimidated by them. The lessons learned were: who on the team can motivate, who is timid, who has the energy to make changes in an instant, what are the boundaries we deal with everyday with people and how to communicate non verbally. It was amazing how each team member's personality popped out when working with the horses. A true and great experience for anyone wanting to learn more about yourself and your team. Stacy was outstanding as a leader and the horses were stars. They truly led the workshop. Centaur Development Wellness Ranch is a safe place to experience yourself and gain valuable insights about your life. 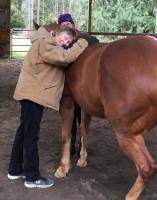 Horse, Ella helped me "see" old emotions and situations I was carrying. With Stacy's guidance, we released and healed them together. It was very powerful for me...and Ella! 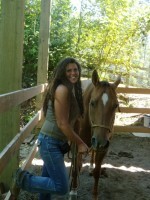 Stacy is a highly intuitive life coach and her horses/teachers/healers will show you what is most helpful and needed now. CDWR is a very special and magical ranch and the horses and dogs are a lot of fun!